Yay! 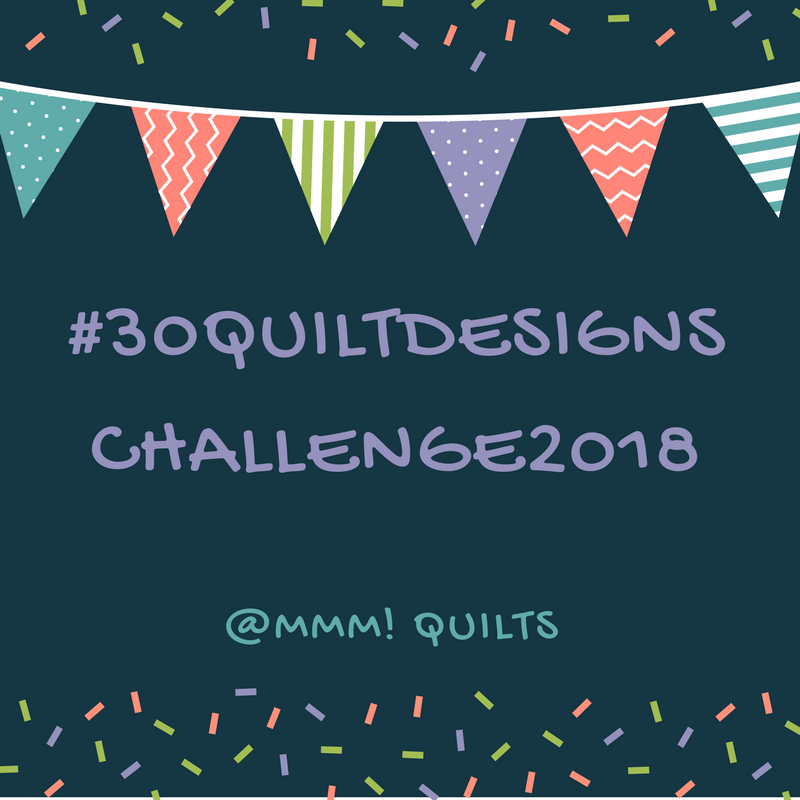 The second annual quilt design challenge begins today, hosted by me, on Instagram. A little history: Rachel of Stitched in Color was the one who I first saw hosting this on Instagram. I noticed it part way through and did not join in, too shy, but privately thought that it would be a good learning curve and push to get more designs out of my head and onto paper. So, near the end of 2016, I asked Rachel if she would be okay with me hosting a similar challenge for the first part of 2017. Yup. In conversation with Lisa of Sunlight in Winter Quilts, we realized we both had wanted to join in with Rachel, and so I asked if she'd like to co-host with me, yup, and so we did. It was small but successful. What do I mean? Read on! ....led to my first publication in an e-zine. Another design from that first challenge was just featured in the newest edition of Modern by the Yard, Playtime Plus. Leanne of Devoted Quilter has made four of the quilts she designed, one a gift and three that have either been sold to a website or published in magazines, Modern Patchwork and Make Modern (that will take you to her blog post on it), with a fifth being published later this year. Abigail of Cut & Alter made three of her designs, one was given as a gift, and two were entered in shows, both winning second in their category. Cindy of Stitchin' at Home has made a couple of her designs, and is currently making a variation on another of hers which is going to be published in a magazine! AND, she is using the fabric she won from Melody at The Red Hen Shop, my sponsor last year and one of two again this year, to make it! It's interesting that I said in last year's post that the best prize, because I had no sponsor when I wrote the info post, and then Melody contacted me😁; anyhow the best prize was "the designs that are yours and yours alone, and that you've challenged yourself, and realized growth." So true! 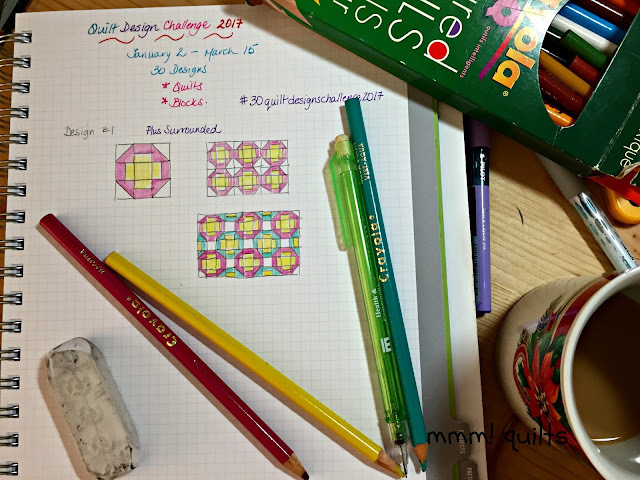 I hope you will consider joining us this year; it really is fun, and a terrific exercise to make yourself sit down and doodle/draw/colour/play in your quilt design software. I admit I was a bit scared to put my drawings out there, but what a wonderful group we had, and I think the creativity flowed off each other and wound around us like those gymnastic dancers with the ribbons, and we got such good vibes from our friends who cheered us on. Design a quilt block or an entire quilt. If you draw a quilt block, please put a few together to see what an overall pattern might look like. Add some colour. **Just as Rachel said in her challenge, you can use non-original blocks, but re-invent them by changing up colour or value, or put two non-original different ones together and see what magic can occur! The goal is to create 30 quilt designs by April 17. Figure on doing a design every other day. 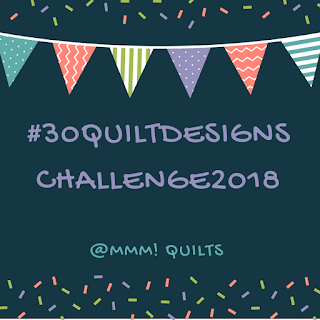 Please tag each photo @mmmquilts so I can see your designs! Be sure to number and date each design. Because...as Henri Matisse said, "Creativity takes courage." And, as Helen Keller said, "Life is either a daring adventure, or nothing at all." And a new one for this year from a Seth Godin, whose thoughtful and thought-provoking messages are deposited into my inbox each day, "If it scares you, it might be a good thing to try." Melody's store has been on Etsy for 5 years. She has yardage and bundles, designers such as Amanda Murphy and Malka Dubrawsky, and Moda, Benartex, Quilting Treasures, and Windham Fabrics to name but a few of the companies she carries. The best part? Her prices for new fabric are $10US/yard! And I like that she cuts what she calls a "true yard", as well as "hefty fat quarters", 2-3' larger than the standard measurements. Melody is again offering multiple prizes: two $15 gift certificates to be drawn at the 10 and 20 drawings mark, and a grand prize of $50 to one winner who completes all 30 designs. Cool fact of note is that Cindy of Stitchin' at Home is using fabric she won from Melody last year to sew up one of her designs from last year, which is going to be published in a magazine! Darla's store has been online for just 6 months, hard to believe when you take a stroll through her website and see the professional flair, and drool over the latest modern fabrics, with designers the likes of Carolyn Friedlander, Tula Pink, and Alison Glass, lots of Kona solids, and companies such as Art Gallery Fabrics, Robert Kaufman, Andover and RJR to name a few She has half yard and fat quarter bundles, as well as yardage, all at reasonable prices. She felt there was "a need in the Canadian marketplace for more modern fabrics, patterns and supplies" and boy, has she delivered! Darla is offering a second prize which is a $25 gift certificate to one winner who completes all 30 designs. 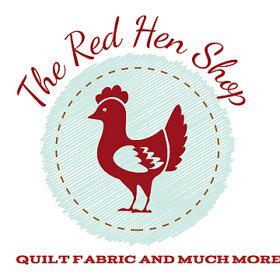 Anja of Anja Quilts told me that "the service is great," and also said that she put in a group order which came in lower than the quoted price, so she gave them the lower rate AND a great shipping rate and included a small freebie because the order was over $100! Darla also has brought in the new Kona colour cards. I might just be offering a third prize to one winner who completes all 30 designs. Prizes are for anyone around the world. See you on Instagram! Oh - if you don't have Instagram, or your account is private, consider opening a public account for this challenge or contact me and we can arrange for you to email me your design photos and I can post them for you. Feel free to grab the button and post it on your blog if you are joining in. Oh goodness, I am so tempted to join you in this. I really need to get back into the designing & blogging & quilting. Gosh, I just don’t know if I have the time..... hrm hrm hrm. I remember seeing all of the cool ideas last year and I really wanted to join in. I'm sitting here chuckling to myself, as the squirrels are wreakig havoc with any possible focus I might have! Hahaha. I am really excited to be a part of this! I remember when Rachel had hers going, and I didn't jump in either. I enjoy sketching patterns, but they rarely get off the paper into reality. Maybe this will help! Thanks for hosting this! Time to start playing in EQ again. I thoroughly enjoyed last years design challenge and have made a couple of them and am having a variation of another one published in a magazine. I’m in. I am not sure I have 30 Patterns in my sketchbook, but this is such a fabulous way to debut them. Thanks for hosting. I don't feel very creative when it comes to quilt design, but I think I'll give it a whirl! Thanks for hosting! I will be following this but not ready to join in this year. Two question please. this for publication as their own? Just an example. I look forward to seeing what comes out of this year's challenge!! Well there has been a TON of discussion on QBL around designing and personal property etc. In all reality, unless you publish someone else's design or send it to a magazine and it isn't yours, nothing to worry about legally. Quilters police themselves pretty closely; there have been a few cases where a blogger was shamed publicly for stealing another design. Lorna at Sew Fresh Quilts confessed and wrote quite a post, along with the blogger from whom she stole. and with whom she has become good friends, about her experience. I admire her for having done this. There is my challenge I ran last year, and there is Rachel's. We shared the hashtag, which has 225 posts within it. I would think that if someone posts on Instagram a design they've stolen from that pool from last year, that someone else is bound to spot it. That said, many things are similar; many people come up with the same design, and quilt blocks have been around FOREVER. The Perkiomen block for example although it says is design by so-and-so for the fires, is not his original design; it's a split 9-patch, been around forever. Lots of variations. Honesty is what I always expect, and I've been pretty rarely disappointed in my 57 years of life. Hope this helps! I may try a few, but don’t think I can do 30 days with all I have coming up. Will be fun to watch and maybe try a few! I look forward to seeing the results of this year's challenge!